Serving America�s finest gardens since 1908. For over a century, the John Scheepers Beauty from Bulbs catalog has specialized in providing gardeners across America with a vast selection of estate quality Dutch flower bulbs that includes both classic heirlooms as well as exciting, new and rare hybrids. Flower Bulbs - Find a huge selection of unique and exotic varieties that are sure to enhance your garden and delight your family and friends. From Triumph Tulips and Dutch Irises to Fritillaria persica and Allium Globemaster, you�ll find an unparalleled collection to grace your family's garden, however big or small. John Scheepers also offers the largest collection of plump Amaryllis and Paperwhite bulbs for indoor blooms over the winter, as well as Amaryllis and Paperwhite Gift Boxes for exquisite holiday gifts. Tulips - Referred to at times as the "Tulip King", John Scheepers was responsible for appointing the tulip as the enduring spring icon and for introducing many of the Dutch flower bulbs that fill America's spring gardens today. Fill your online wheelbarrow and garden with a lush and inviting assortment of Spring tulips from the goblet-shaped classics found among the Giant Darwin Hybrid, Triumph and Single Late Tulips, to the wildly decorative and unusual Parrot, Fringed and Viridiflower Tulips that are rarely available elsewhere. They are as gorgeous in the garden as they are in opulent cut flower arrangements rarely found at the best of florist shops. Narcissi - Create a sea of cheerful, dancing daffodils in your family's garden for generations of enjoyment. These hardy naturalizers are not just yellow...John Scheepers offers all sorts of forms, heights and colorful combinations, some of which may remind you of intricate, delicate works of art. Deer and rodent-resistant, Narcissi are one of nature's most glorious gifts to the garden. Rare and Unusual Flower Bulbs - Interested in incorporating a host of rare and hard-to-find flower bulbs into your garden? John Scheepers carries a diverse collection of fragrant Hyacinth, imperious Fritillaira, whimsical Allium and luscious Lilies as well as special blends of Crocus, Muscari, Rock Garden Iris, Chionodoxa and Hyacinthoides. And this is just a small smattering of the many exquisite flowers that you could include in your spring garden. Top quality John Scheepers flower bulbs are easy magic. Indoor Bulbs - If you're looking for beautiful bulbs to brighten your home through the long winter months, you'll discover a lovely selection of indoor bulbs from traditional to extravagant Amaryllis and fragrant Paperwhites. Greenhouses may be filled with pots of John Scheepers fragrant Freesias, vibrant Ranunculus and delicate Anemone Giants. 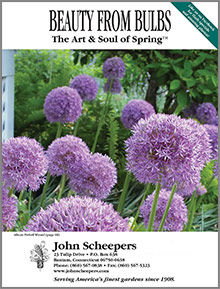 Since 1908, the John Scheepers Beauty from Bulbs catalog has revolutionized American gardens, beautifying private and public landscapes with their innovative design concepts, horticultural introductions, top quality Dutch flower bulbs and personal service.